Once upon a time, creating client engagement online took a lot of time and effort. Advisors labored to create original content, or scoured the Internet for articles to share. Results were often stodgy, boring, and mediocre. Clients and prospects ignored the shared content, and no one lived happily ever after. 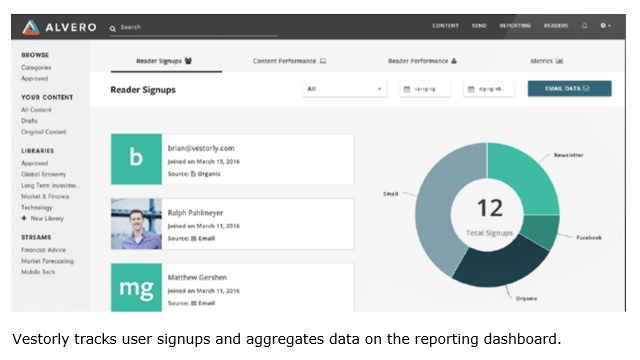 Along came a wave of startups looking to automate and improve client engagement. One of those was Vestorly. The Vestorly platform was created in 2012 by Justin Wisz and Ralph Pahlmeyer to solve the digital relationship-building puzzle. The two founders, who previously started a digital advertising and lead generation firm called AdvisorLeap, began Vestorly with a simple premise: helping people read and share interesting content. When I first heard of it, the idea sounded intriguing because it promised a high level of automation and customization at the same time, boosted by data analysis. Since Justin Wisz, the CEO of Vestorly, and I were at the 2016 Envestnet Advisor Summit in Chicago together, we sat down for a chat about social media, client engagement and the state of his firm. Wisz and his team originally set out to build a better data-driven marketing platform. Their goal was to go beyond curating personalized news feeds on a large scale and to reach for delivering actionable business intelligence data. Provide data advisors did not previously have. The Vestorly platform is powered by an artificial intelligence engine that uses a proprietary algorithm in a sequence of “if-then” decisions that learn from past experience. Wisz referred to this as a “closed feedback loop”. He explained that every event on the platform is tracked, so that it can be used to inform the next steps. According to Wisz, the Vestorly platform drives next-generation engagement. This goes beyond just sending out emails and requires leveraging technology to build relationships. Today’s investors are more tech-savvy and expect more online interaction with advisors. It’s more than just Millennials that want content that is “personal, mobile, and in real-time,” observed Wisz. Vestorly is one of the leaders in a relatively new market segment of automated digital marketing tools. Their competitors include AdvisorStream and Grapevine6. When advisors first sign up, they import or upload their contacts into Vestorly. The platform currently offers integration with popular CRMs Salesforce and Redtail. Advisors can import their contacts and can also tell Vestorly to synchronize data so that any new leads created in Vestorly will be be reflected back into the CRM. Vestorly then generates the first newsletter to all contacts. The initial batch of articles is mostly generic, and the same content goes to all contacts. This is a bit ‘spammy’ in my opinion. I would prefer that they work more like their competitor, Grapevine6, which analyzes your contacts’ LinkedIn profiles so that even the very first email is personalized. The first newsletter with around six articles is sent automatically by Vestorly via email. It is white-labeled with the advisor’s branding and looks very slick and visually appealing. Any subsequent interactions that the client has with the content are tracked by the Vestorly algorithm. The collected behavioral data is analyzed, and used to customize subsequent content. As a result, the second newsletter will come in multiple “content cluster” versions. The newsletters become more refined with each iteration with the end result of almost every client receiving a unique batch of content. While there is value to automation, I like the functionality in Grapevine6 that allows you to tweak every contact’s content preferences manually using a bunch of sliders. In addition to the personalized newsletters and social media posts, Vestorly can be integrated with the advisor’s website for seamless browsing. The artificial intelligence engine only has access to system-read content, so advisors are assured that no articles about Donald Trump will show up in clients’ feeds, unless they express an interest. This is important, because the quality of curation is critical for delivering relevant and engaging articles. 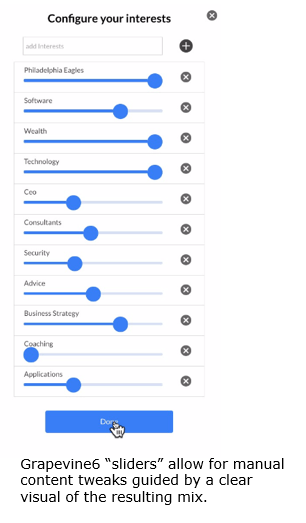 Another unique aspect of Vestorly is its ability to shift the advisor’s focus from generating and curating content to looking at interaction data. Writing newsletter articles, recording videos, and curating content takes time. By relying on Vestorly, advisors can save themselves hours of work, get better customization, and focus on taking the next steps towards enrollment. 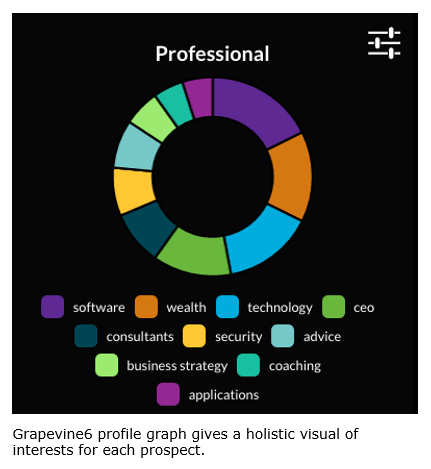 Something that is missing from Vestorly is a profile interest graph like Grapevine6 has for every contact. This provides a visual representation of each contact’s interests. The platform is enterprise-friendly, with centralized control and administration Although Vestorly has applications across many industries, its compliance module is custom-built for wealth management. Home office has the ability to customize control and supervision settings. As a result, clients and prospects receive a consistent corporate brand experience. The recent launch of Compliance Exchange enables users to meet broker-dealer content approval, archiving, and social media guidelines automatically. Wisz claims that Vestorly delivers sales enablement… How? One of Vestorly’s big selling points is its ability to generate warm leads. “When you send personalized collections of content to a client or a prospect, there is an almost 30% chance that it will be forwarded to a friend, family member, or a colleague. When they do that, 69% of the time the recipient activates it,” shared Wisz. Once the new prospect opens the email and opts into the system, he gets access to a personalized news feed and becomes a lead. 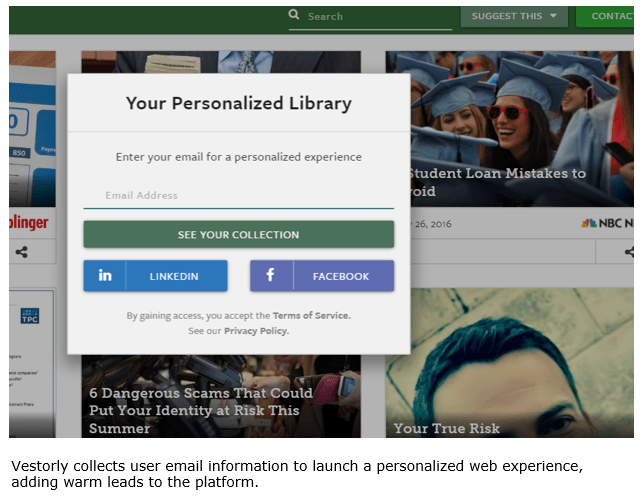 A case study for Halbert Hargrove illustrates that in about 30 minutes of human time invested per week, the firm’s clients get a curated steam of content on the website and personalized e-newsletters. Halbert Hargrove reports that its database grew by 15% with client referrals prompted by Vestorly content. One prospect reached out unsolicited and became a client. How typical are those results, and how well does Vestorly convert warm leads into clients? According to Wisz, conversion results vary. The platform currently does not track the close rate for Vestorly-generated leads as compared to other leads. Wisz explained that Vestorly is primarily a sales enablement engine. Its purpose is to offer interesting content, save the advisor time, and provide data for action. I was disappointed by the lack of an automated feedback loop from Vestorly back to CRM. The subscriber can see client interaction patterns and history in Vestorly. Unfortunately, they do not automatically transfer into the original CRM. There appears to be a way to pull some of the data into the CRM, but the process is manual and the number of fields is limited. In January, Wisz has secured an additional $4.1 million in VC funding for his firm. The money was directed to improving the product map and refining the platform’s functionality. Vestorly currently has 800 clients, many of them large RIAs and broker dealers. Advisor Group (formerly AIG Advisors) and Mercer Advisers are among the clients. Orion Advisor Solutions portfolio accounting service now includes Vestorly Standard digital content subscription at no additional charge, with advanced customization and data reporting available for a fee. Vestorly’s digital content is available on Pershing’s NetX360 platform for RIAs and broker-dealers that custody with them. Pershing acts as a reseller of Vestorly, and Wisz claims they have helped his firm close a number of large deals. Real-time engagement is gaining traction in the industry, with Envestnet announcing its partnership with AdvisorStream at the Advisor Summit. This platform allows advisors to leverage licensed content from leading publications. Users can distribute compliance-vetted content, monitor open rates, and deliver a user experience that is mobile and uninterrupted by paywalls and third party sites. In 2014, Vestorly announced a partnership with FinanceLogix. In light of the acquisition of FinanceLogix by Envestnet, this arrangement might fall by the wayside. Wisz shared that his team is updating the core algorithm to improve suggestions based on past behavior of the prospect. If a lead had opened multiple newsletters and demonstrated an interest in retirement planning, the system will suggest that the advisor reach out with a one on one message to schedule a conversation. Vestorly and their competitors are a vast improvement over static content libraries. With the recent round of VC funding, the Vestorly platform will continue to improve as more data and functionality becomes available. The development of sales enablement suggestions sounds particularly promising, because no other platform on the market today does that. Final verdict? Vestorly is not meant to be a replacement for the advisor’s strategic decision-making, but it can reduce workload, provide real-time engagement data and provide scale for the advisor’s prospecting and sales enablement.